By now I guess everyone has heard about the Senate Democrats deciding to shut down the government. What’s surprising to me about this is why they are choosing to do it, and what it shows about their priorities. Who are they really working for? As you may have heard, a government shutdown is looming here in D.C. Many of you out there watching probably think, “So what? That can be a good thing. Less of Washington, fewer bureaucrats telling us what to do and how to spend our money.” Those are all good points. 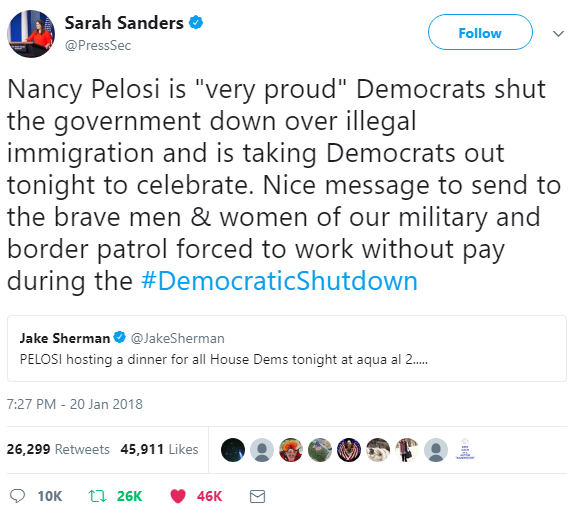 But that is not why Democrats are threatening to shut down the government. Let’s keep in mind this is the same party that is always telling us if we shut down the government, this will be a travesty for millions of Americans, so many government programs and services will be unmet. But yet they’re still willing to do so. Why is that? Well, it’s because their liberal base is demanding that in this election year they put the needs and desires of those who are here in this country illegally before anybody else. Democrats don’t just want increased illegal immigration, they want chain migration, too. When you allow chain migration, you’re not selecting people to come into the country who can speak English, who have college educations, who can perform skills in short supply. Chain migration doesn’t require immigrants to speak English or be able to work. It doesn’t require anything beyond a family connection. “This is a shutdown over whether or not we could give amnesty to illegal immigrants who are here, and have chain migration allowing them to bring distant relatives. That’s not going to work out well in November [for Democrats] if they say they are the party in favor of amnesty and distant relatives,” he added. Countries like Canada and Australia only allow in immigrants who can speak English and who have skills that are in demand, like information technology or medicine. That’s the way immigration should work. We shouldn’t be bringing in people who will cause the rest of us to have to carry them through life. We should be focused on skilled immigrants, but the Democrats are focused on unskilled immigrants and the family members of those unskilled immigrants.